This course is a potent, action-packed one-day training-intensive experience for coaches and athletes. The curriculum is dense and designed to accelerate your ability to learn, apply and master essential kettlebell skills and drills. Participants will glean training insights that will add effective variance to their current CrossFit programming, and they will learn to move more efficiently, effectively and purposely, resulting in better performance, overall endurance and power output. Improve performance through better biomechanics. Quickly assess and correct common errors. Perform a systematic progression of exercises with a single kettlebell (endurance focus; i.e., swings, cleans, push presses, snatches). 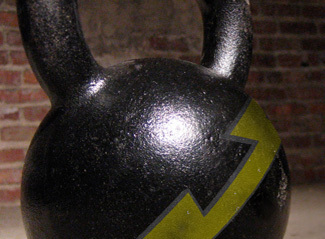 Perform a systematic progression of exercises with two kettlebells (power focus; i.e., swings, cleans, thrusters, double snatches and the long cycle). Increase performance through movement-specific breathing cycles. Understand and apply key elements of the Turkish get-up. Upon successful completion of this course, a Certified CrossFit Trainer may claim 8 CEUs towards their continuing education. Due to the large quantity of courses scheduled, we do not accommodate refunds or transfers.